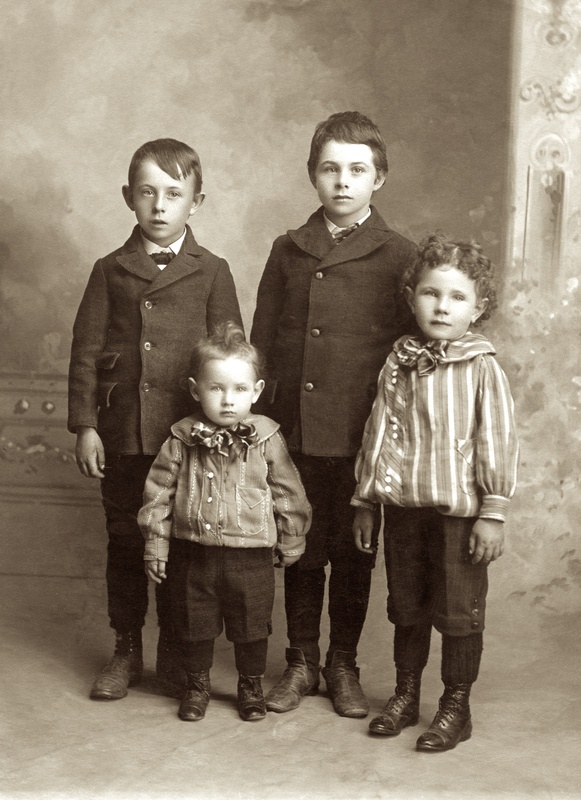 A newly discovered 1903 photo shows four Hanneman brothers of the Carl Frederick Christian Hanneman family. It is the earliest known photograph of our own Carl Henry Frank Hanneman (1901-1982). The photo was taken at Grand Rapids, Wisconsin. In the front row are Carl (at left) and Wilbert George (1899-1987). In the back are Frank Herman Albert (1895-1947) and Arthur John (1893-1965). The firstborn of this family, Charles M. Hanneman, died just after his birth on November 24, 1891. The boys were the sons of Carl Frederick Christian Hanneman (1866-1932) and Rosine Bertha Henrietta (Osterman) Hanneman (1870-1918). The couple were married in 1891. The photo was scanned from a collection loaned to us by Thomas Donn Hanneman of Minneapolis, one of the 16 grandchildren of Carl F. and Ruby (Treutel) Hanneman of Mauston, Wisconsin.